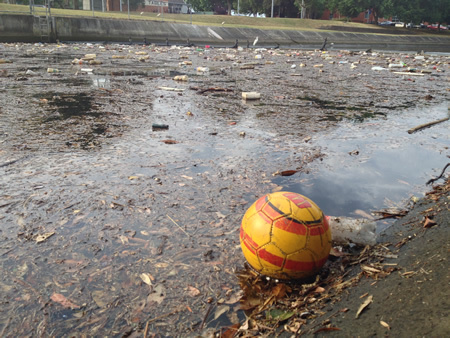 It’s not just any drain, it’s the Moonee Ponds creek in Melbourne, with the City Link running over the top. I’m not sure what the big red things are: art installation or plastic bag catchers. 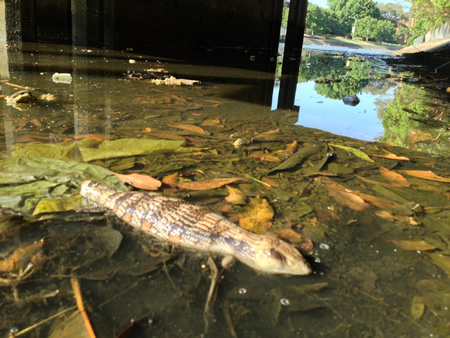 This great pic was sent in by expat Novocastrian and former drain rambler Ken, who was back in his old stomping ground recently and took his lad down the drains near Waratah Park. It’s excellent that our drainy heritage is being passed on to the next generation. The creek’s been quietly lately: no students taking short cuts to the TAFE, no quad bikers, no dog walkers (apart from me and Jambo). The clean-up squad’s been and gone; I missed Dave and the boys but the mountain of plastic that had built up has been taken away. Which is very timely, as the Australian Marine Conservation Society is running an anti-plastics campaign at the moment. 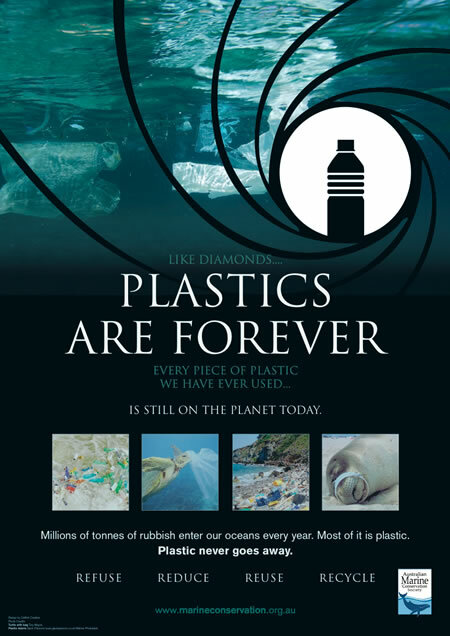 Called “Like diamonds: plastics are forever”, it reminds us that “every piece of plastic we have ever used is still on the planet today”. You can donate to their campaign here. I don’t think this eel died from ingesting plastic, unless he ate a ruler. I don’t think I’ve ever seen an eel so straight. This blue-tongue was laid out pretty straight too. 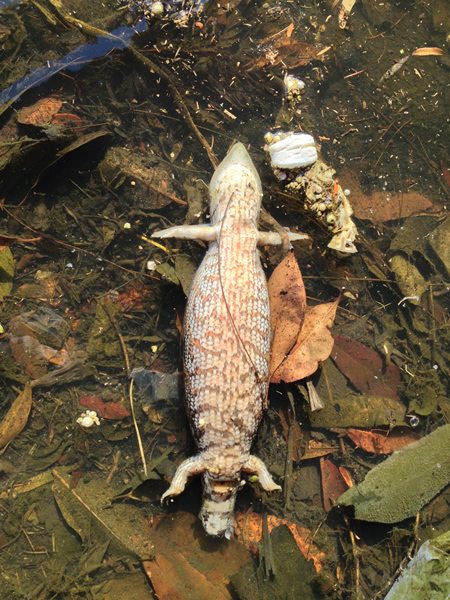 Not sure if he lost his tail in a fight with a dog or if it was snapped off after he drowned. 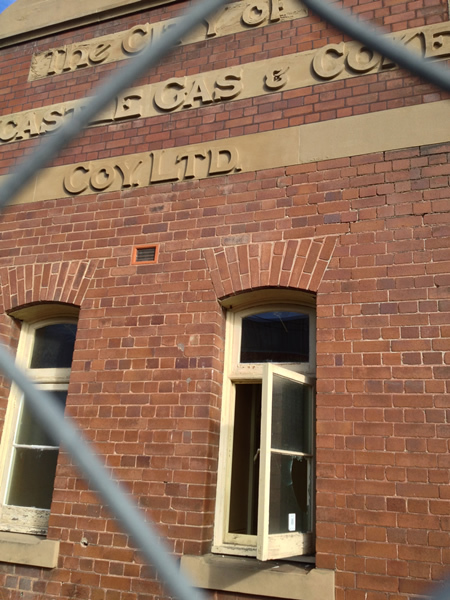 I mentioned recently that the coal tar in the old gasworks had been on the move since the warm weather kicked in. Here’s a nice example. This liquid ooze popped forth from the ground when I was walking round there the other day. I felt like Jed Clampett, though I wasn’t as pleased to see this “Texas tea” as he was! That’s me at the moment, in spite of my bung leg, Christmas deadlines and the looming fiscal cliff that’s so troubling the US. 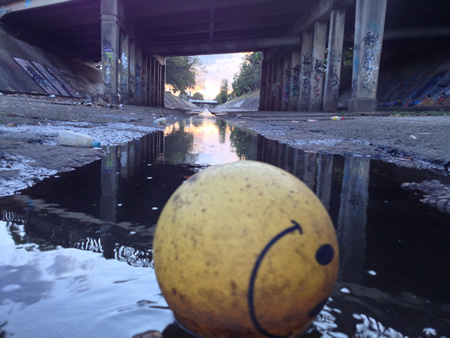 And it’s impossible not to be happy when you see a big yellow smiley face. Impossible. The recent rains weren’t as heavy as predicted. Steady rains are much better for the garden but don’t create great flushes in the creek; rather, there’s a steady build up followed by a steady fall. 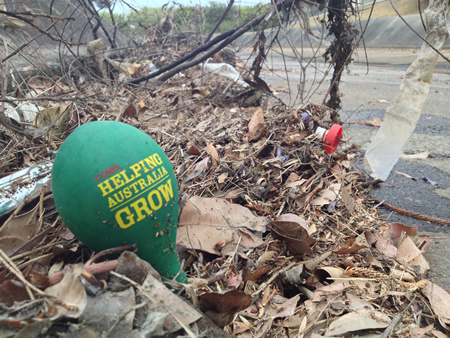 The litter just bumps up against the boom at the TAFE, so this is a good thing: at least it’s there to get collected. But when the rain has gone away, and the water level’s fallen, and the wind changes, we’re left once again with an ugly mess. 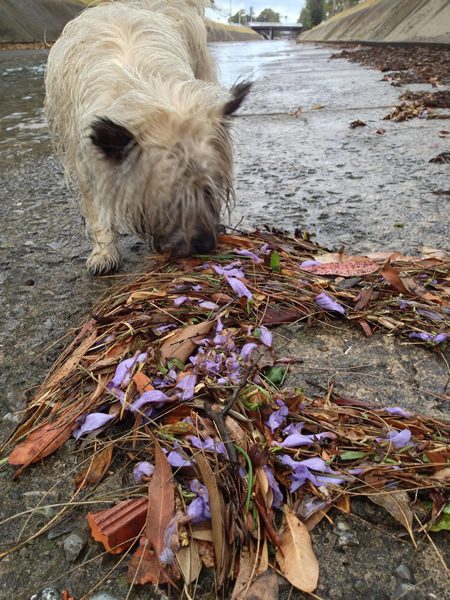 The steady flow has created lots of beautiful patterns from the leaves, sticks, jacaranda blossom and other debris that gathers on the creek bed. I never tire of the gentle curves and arcs that they form and continually photograph them. Thank God I’m not paying for film development. 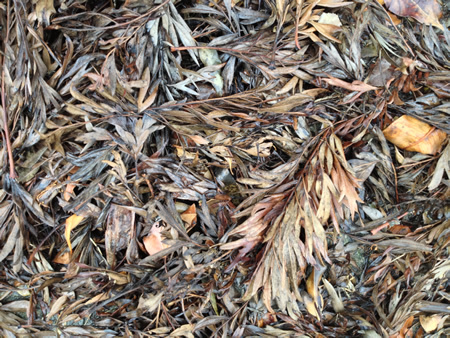 These she-oak leaves collect next to Bates Street and tangle together to create an interlocking raft. 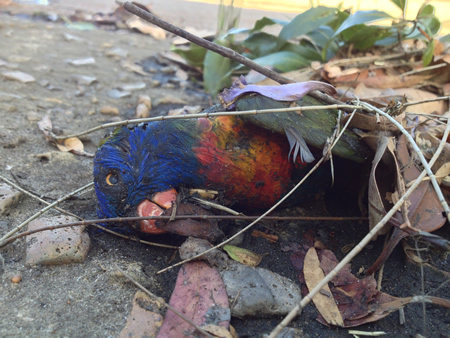 A colourful pile of fabric caught my eye and I thought it was yet another recruit to the Legion of Lost Children’s Toys but, when I stooped to photograph it, I realised it was a dead rainbow lorikeet. 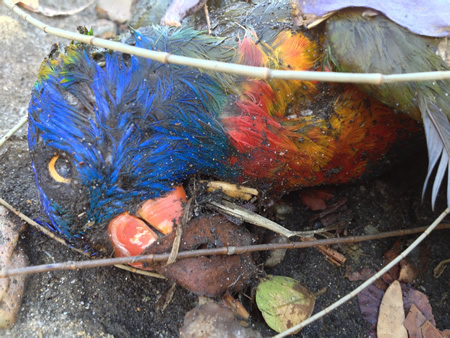 I never think of these pretty birds as ever being dead. There job is to fly around looking gorgeous and adding sparkle to the skies. If ever thought about life after sparkly flight for these guys (which I never had) then I would imagine that they’d be carried off by a warm zephyr to a place in the clouds full of nectar and ambrosia. But that’s the drain: always throwing reality back in my face. 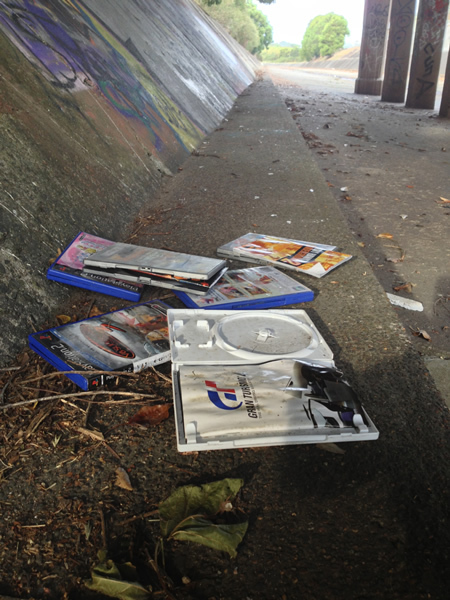 The pile of DVD cases under the Chatham Road bridge was continuing to grow and there was this right shifty-looking geezer there the other day, though he quickly scrambled up the banking as I walked upstream from the gasworks. Since then it’s stopped. Either Jambo and I have scared him away from a life of crime or he’s chosen to dump his loot elsewhere. 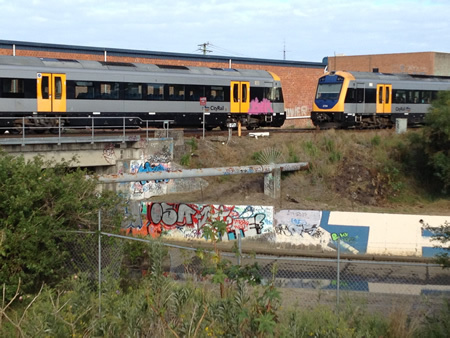 I saw two trains that had stopped for a chat, one empty and vandalised and off to the sheds for a bit of train pampering (or perhaps “pimping” would be more trainy, masculine and contemporary – if ugly) while the other was was all clean and full of people. I don’t know why it should tickle me but tickle me it did. What were they saying to each other? Ooh. I just had a thought: maybe it was the drivers who were talking, not the trains. I really should rein my imagination in a bit! After this walk I went back through Ham North rather than back up the drain. On the way I passed the old Gas & Coke building. A lot of people having been going in there lately for a look round as the back doors have been busted open. Frankly I’m all for this, but not every visitor is in there to admire the pressed metal ceilings or grieve over the way this architectural landmark is being run down. 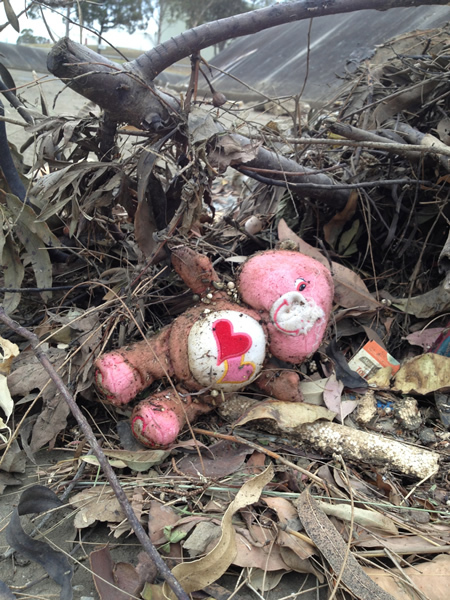 There are kids who go in there simply to trash something, and this worries me. The roof is showing signs of going and now some of the windows have been broken. 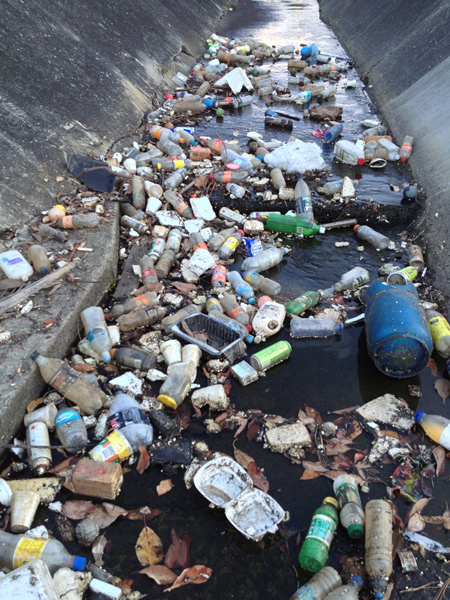 If water gets in – when water gets in – some of the processes of decay will be irreversible. 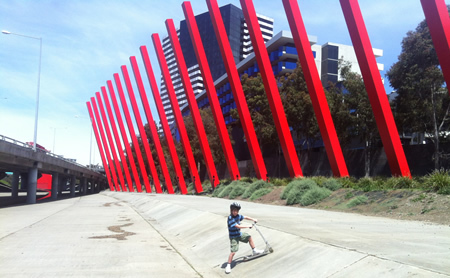 I’ve emailed Jemena again about this building, but still no reply. I’ve sent them the link to Renew Newcastle’s excellent promotional video on the ways in which they’ve repurposed some of the city’s empty commercial spaces (as featured on SBS News the other day). But no reply. And that makes me NOT HAPPY. When I got down there the other evening I found that not much had changed. 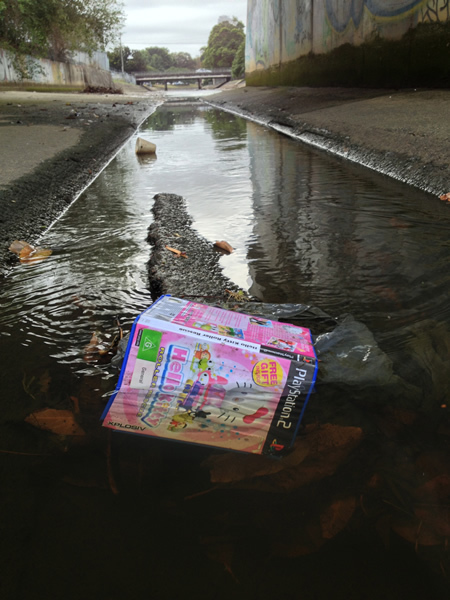 The rain that I expected last week didn’t happen, though as I’m typing it’s falling gently and I reckon there’s enough to flush away the rubbish, such as this pile of DVD cases that appeared under the Chatham Road bridge, DVDs missing. Hmm. I opened a bookshop once, a million years ago, and was fortunate enough to have a staff member who had (a) worked in retail before and (b) understood how retail worked. After the Melbourne Cup she said, “Well, we’d better get the Christmas decorations out”. I told her that (a) we didn’t have any Christmas decorations and (b) why on earth would be put them up in November? Surely they went up about a week before Christmas? We were equally dumbfounded at the other’s stupidity. But I was one who didn’t get it: she was right. I bought decorations and she put them up and, every year thereafter, Melbourne Cup day was when I climbed into the attic and pulled out the dusty boxes with baubles and streamers and little Santas. I was reminded those days when I came across this little lot. 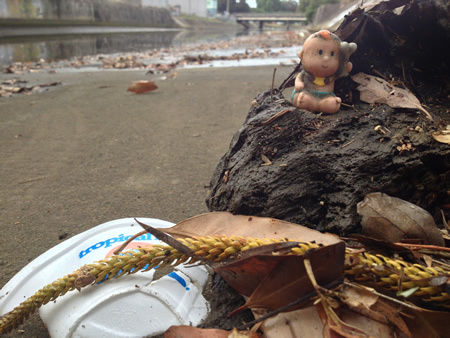 The tide had formed the leaves and litter into neat, arc-shaped sculptures and decorated it with scraps of packing tape, bottle lids and balloons. It’s quite festive and jolly, and appeared just after Melbourne Cup. This little character is not Santa but added to the general feeling of the drain being sparkled up for the coming season. It seems to be a small baby clutching a bone, which is odd. Could it be Pebbles or Bam Bam from the Flintstones? 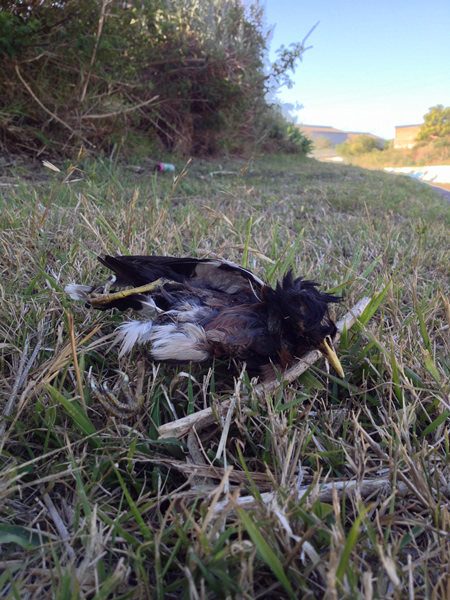 I’m not sure where I’d hang this Indian mynah. Perhaps he could sit at the top of the tree and glower down at us through the black sockets where his eyes once were. Yo ho ho! 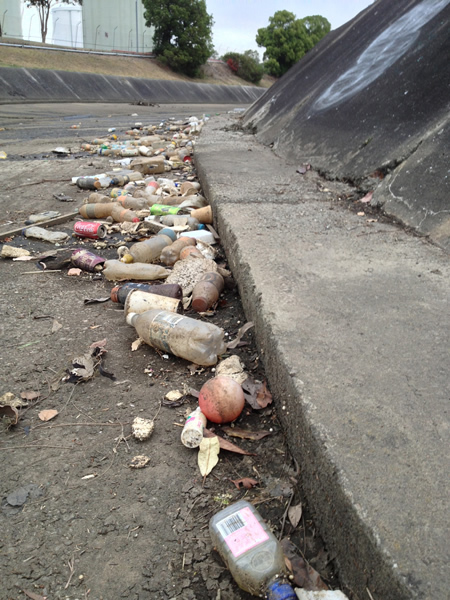 At least today’s rain will get rid of the litter by the TAFE. I know that it’s only moving the problem somewhere else but it just gets too depressing seeing the same filth day after day. 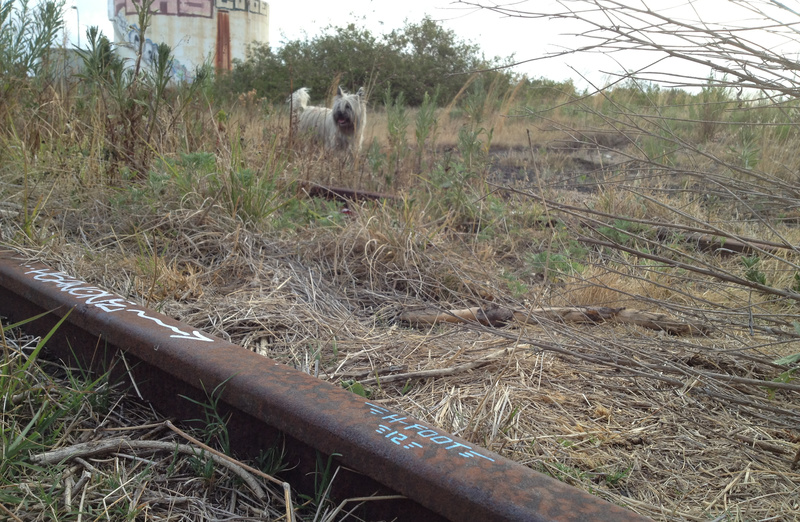 I was struck by the ordinariness of the graffiti. Somehow I expected to Vienna to turn it on a bit more – European capital of culture and all that – but all they can manage is the same pretty uninspiring stuff as your bog-standard Mayfield drain. Sure there’s the odd decent piece but overall I thought it was rather ordinary. 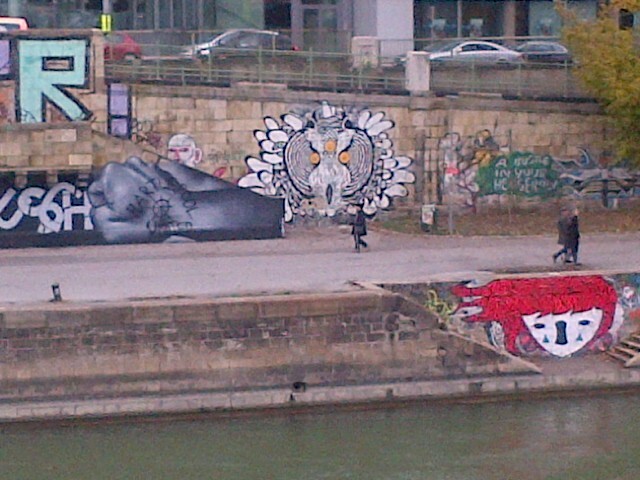 Which maybe says something about the kind of painting that appears on these kinds of surfaces. I might do a thinky piece on that in a future post. A couple of years ago I edited a book written by an anthropologist who worked with communities along the Murray and Darling rivers. This was at the height of the drought, about a year before La Nina came along nearly washed Brisbane away, and there was a common thread that ran through all the feedback: the river needs a big flush. These big flush events can be mixed blessings. Of course it’s good for ephemeral marshes to be inundated but there’s also the spread of feral and pest species, the effects of black water on oxygen levels, the moving of filth into all kinds of unexpected places. But I was reminded of everyone’s desire for a “big flush” myself the other day as I passed under the Chatham Road bridge. It’s getting jammed up there with litter and filth and, even though I know it’s only pushing the problem somewhere else, I really wished for a big rain to take it all away. 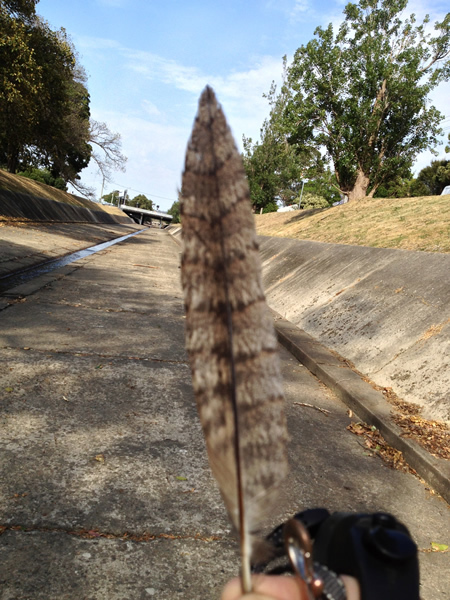 Among the trash was this beautiful feather. Is it a goshawk? Or maybe a koel. I’m not sure. 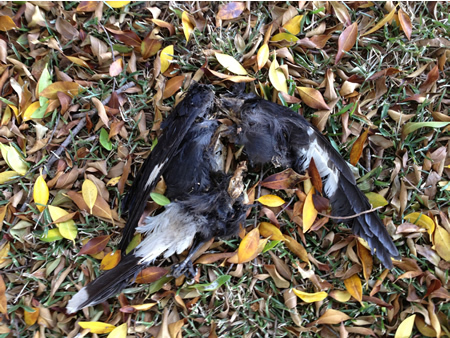 It certainly doesn’t belong to this young magpie, discovered at the foot of one of the figs in Richardson Park. But in the midst of death is life, as it were. The gasworks is teeming with flies at the moment; it reminds me of being out bush in central Australia near a cattle station. (That’s my benchmark for fly-i-ness.) 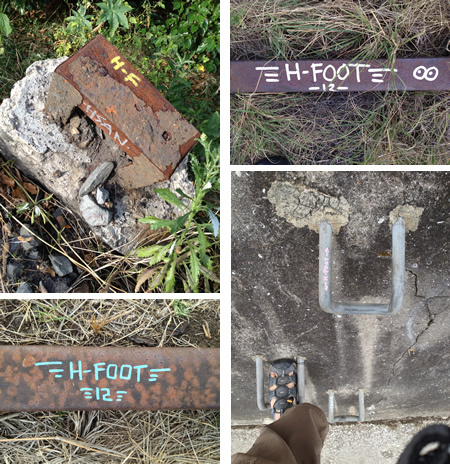 But my walks around there have been given a fun boost by my new best friend, H-FOOT. 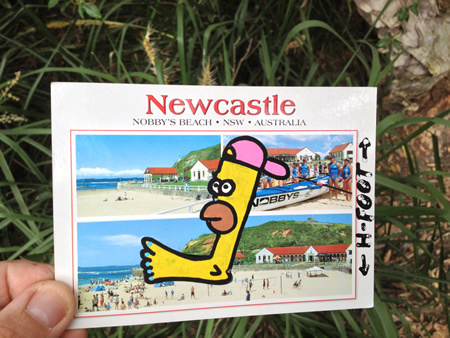 I don’t know who s/he is, but since I received my cryptic postcard I’ve noticed his/her markings all around the place. Am I being stalked? I do hope so! The cylinders in the ELGAS place are starting to gather, a bit like the wildebeests do before taking off on their mass migration across the Serengeti. The herd makes decisions about the elderly, the infirm, the weak and the rusty; they are “The Condemned”. The rest group themselves into large packs. Actually, I’m not sure that the wildebeest analogy really works. They look more like something off a Pertwee-period Dr Who. 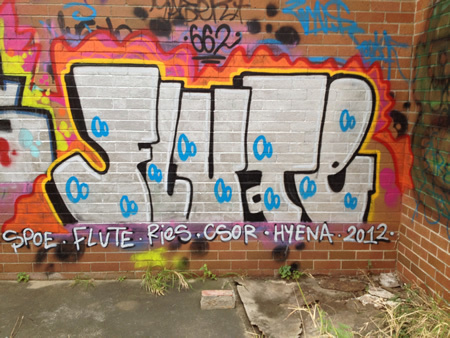 There’s also been a bit more graffiti activity in recent weeks. Is it seasonal? 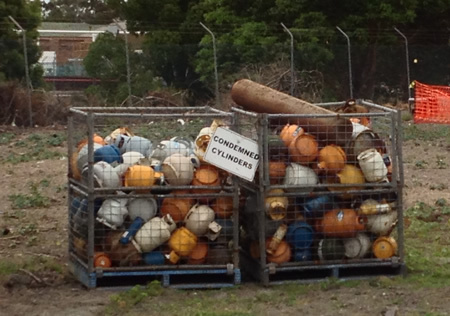 Is it linked to the mustering of the gas bottles? 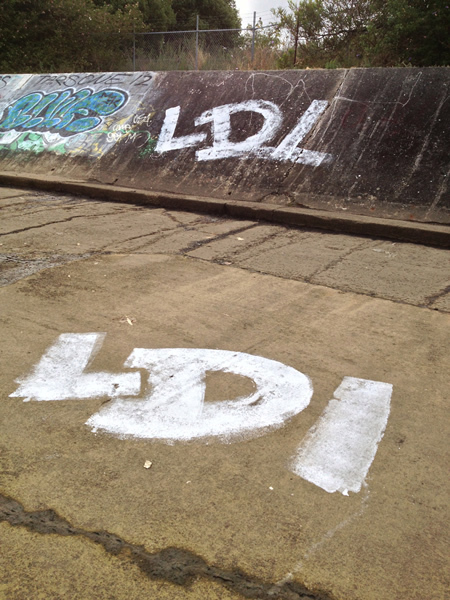 The LDI boys have been out but, to be frank, I’m not impressed with their development. A couple of things they’ve done have been quite interesting but they seem to be stuck in big roller-coaster mode at the moment. The most touching development (and I don’t think it’s just the LDI crew) is the inclusion of gooey dedications to sweethearts: [heart] Alysa; georgia + bella. Aww. The family of ducklings are still at nine, which is remarkable – especially given Jambo’s daily efforts to cull their numbers. 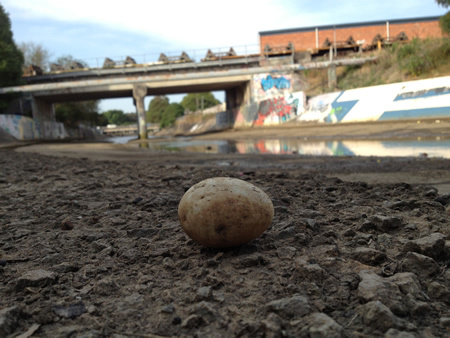 I came across this unhatched duck egg. It must have been quite close to hatching; a little shake and I could feel the embryo rattling around inside. I was about to crack it open to see how developed the little ducky had been but something made me stop; I don’t know, something that made me feel that I should gently put the egg back on the floor and leave it. It’s still there. At least, until the next big flush. The concrete for the bankings of the creek was mixed on site, back in the 1920s. It must have been quite smooth, in the olden days, but now it’s aged and weathered and there are places where you can see beach pebbles and shells, like splinters that have worked their way to the surface of the skin. 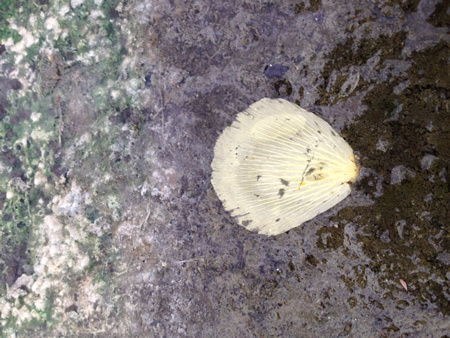 I thought that this was a shell at first, a perfectly preserved cockle shell, but when I touched it it was soft. It looked like one of those fancy Japanese mushrooms but it was a petal, though not a petal from any plant that I recognised. We’re in that part of the season where we have a few hot days then a few cool days, each change marked by bluster and the roar of wind in the casuarinas and the rattle of gum nuts on the roof. The other sound I associate with this time of year is the tattoo of drink bottles on the creek bed. 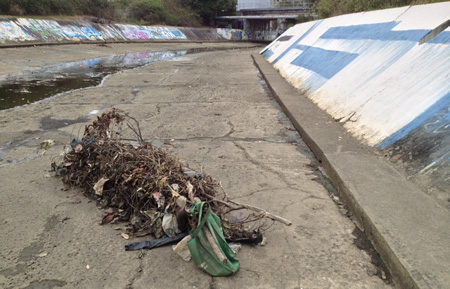 The tide picks them up and they bob around the litter boom by the TAFE, then the tide ebbs and they’re stranded till the wind catches them and off they clatter, eventually forming crescent-shaped middens until the next high tide. Leaves and branches do the same thing. 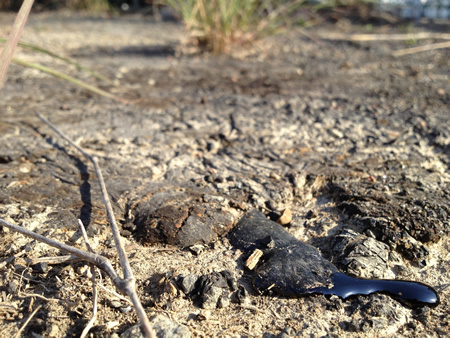 The creek’s punctuated by chevrons of leaf litter, swales made up of sticks and leaves against which all kinds of detritus bangs up and knots itself. 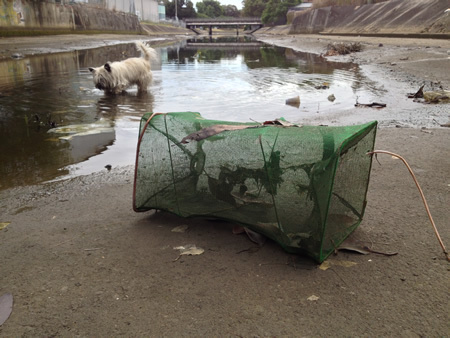 I found another fish trap this morning. This one looks as though it had been put together as a foreigner at work, the frame being made of copper pipe. Or perhaps copper is used to avoid the corrosive effects of salt water. Does anyone know? I also found a fiver. Yay! 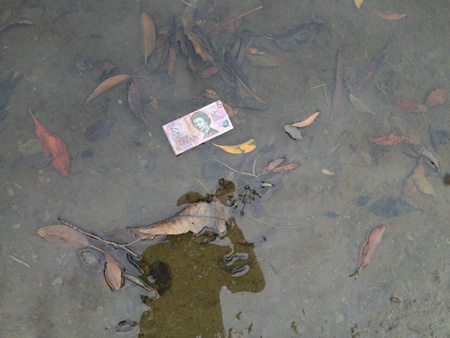 I love finding money in the creek. It has a special carnival kind of feel and I always make a point of spending it on frivolous things like Mars bars, takeaway curries, foam hats, whistles, chocolate-flavoured custard or stink bombs. I held this fiver to my ear. It was a bit wet and was a bit green on one side (the fiver, not my ear) and it whispered one word: “Cider”. 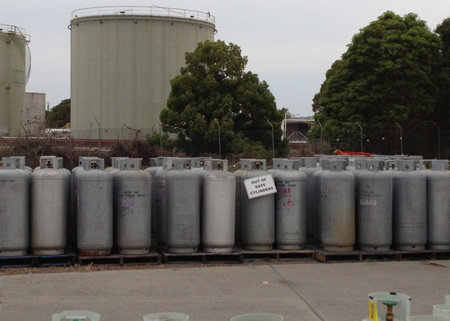 You are currently browsing the Hamilton North, NSW 2292 blog archives for November, 2012.